Thank you so much for your interest in Lasting Words. Due to the overwhelming response (literally hundreds of requests), grant funds that enabled us to provide hospices with free books has been depleted as of April 16. We would like to make Lasting Words available to you at a 40% discount since we could not begin to fulfill the demand for requested copies. This offer will expire on May 16. We request that you only purchase one copy at this discounted price and that it be purchased only for use at hospices. 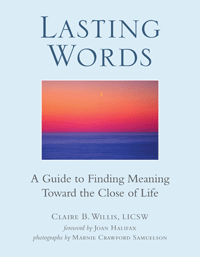 To order your copy of Lasting Words and receive a 40% discount, go to the following URL: http://marcomcentral.app.pti.com/spc/gwp and enter in the coupon code GWPOFFER on the shopping cart page to receive your discount and proceed through checkout. Thank you again for your interest in Lasting Words. We hope that it will be a source of healing and comfort to those who read it. If you would like to be on our mailing list, or are interested in having Author Claire Willis present at your organization, please complete the following form. Please add me to your mailing list. We are interested in having Author Claire Willis come to speak.